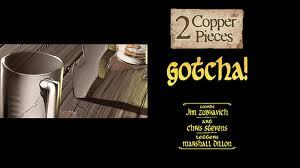 How I Geek : Zubscribed: 2 Copper Pieces - Gotcha! Gotcha! is the second 2 Copper Pieces story from the pages Popgun published by Image, written by Jim Zub with art by Chris Stevens and can be found in the first volume of the Skullkickers trade paperback. Like the first story, Gotcha! is a nice short and sweet story that takes place at a tavern with our heroes, Baldy and Shorty taking down tankards of ale while brainstorming how to deal with a doppelganger. This story is a perfect example of quick little side acts/scenes in gaming sessions. Doppelgangers can be incredibly fun to throw at players. You don't even have to actually put a doppelganger in the game, just generate the possibility of doppelganger activity and good fun will follow. The players will either formulate a plan to weed out a doppelganger from the group before it's too late, if it happens at all. If not, watch the players turn on each other either on their own or by seeds of doubt and deception planted by the gamemaster. What's really fun is planting the doppelganger plot and allowing the players to forget about it over the next few sessions before doing anything with it. With the group I played with, the session would probably turn into an every man for himself event or for no reason at all we would turn on one or two other players and keep them bound and gagged until any possible doppelganger jack assery was thoroughly put an end to. Where we go from here is the big premier of Skullkickers #1, part one of 1000 Opas and a Dead Body.